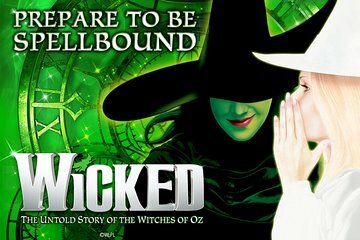 Travel independently to the Apollo Victoria Theatre in central London and settle down to enjoy Wicked The Musical, a mind-boggling extravaganza that’s been entertaining audiences since it opened in London in 2006. Based on the best-selling novel by Gregory Maguire that served as a prequel to L. Frank Baum’s classic The Wonderful Wizard of Oz, this magical show tells of the friendship between two very different student witches — Elphaba, the Wicked Witch of the West, and Glinda, the Good Witch of the North — and sets it to show-stopping songs by Stephen Schwartz. Brought to life by incredible Tony award-winning sets, dazzling costumes and high-flying stunts, this magical adventure will entrance adults and children alike. Select from two seating options for the performance. Standard-price seats offer a good view of the stage and are usually situated in the rear stalls or dress circle. Alternatively, upgrade to top-price seats that command a full view of the stage and get you close up to the performers! If you wish, make even more of your evening by upgrading to include an enticing 2-course pre-show dinner at Sicily in Belgravia. Situated just a few minutes’ walk from Victoria, this restaurant serves modern Italian cuisine and an excellent selection of wines. Seats together will not be guaranteed for a booking of more than 4 people. Amazing!! We had great seats and the theater seating is very comfortable . Superb! A must-see for anyone to London who isn't near a theater in USA where Wicked will show. Completely enjoyable, and in such a beautiful historical theater. To see this in London was fantastic! fabulous show, not to be missed! The production of Wicked was outstanding, but securing our tickets in the one hour window with the crowds and extensive lines was awful! The pre show dinner was a great disappointment. Very poor service, didn't seem to care if we were there or not. Never did get our coffee or desert and had to race to get to the theater. The theater was much further away from the restaurant than described in the tour information. Theater was fantastic, dinner we could have skipped and felt much better about the tour. One of the best play I have ever seen.